Tucson, AZ, WPH Press, 5/25/18- The Fred Lewis Foundation was proud to present the 2018 Armed Forces Tribute Tournament to honor our military heroes at the Tucson Racquet Club in Tucson, AZ on Memorial Day Weekend. Men’s singles and doubles divisions, women’s singles, age level and skill level singles and doubles, and junior singles brackets were presented, with a number of the country’s top professional and amateur players participating. 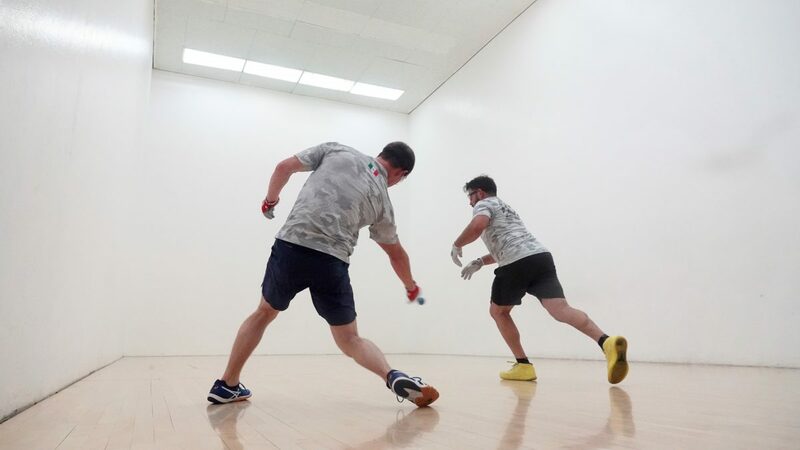 The handball capital of the world provided plenty of excitement in honoring our military on Memorial Day Weekend, as four of the top five ranked Race 4 Eight pros and six of the top 18 R48 pros competed in the 2018 Armed Forces Tribute Tournament. 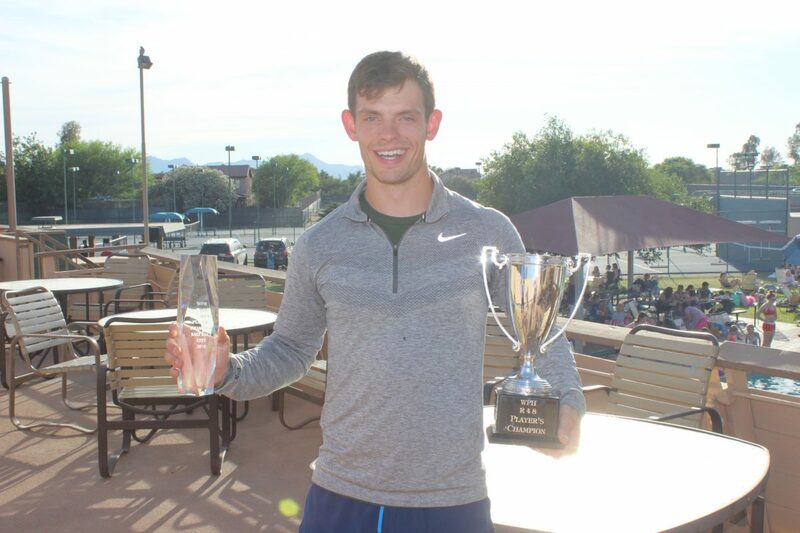 WPH Race 4 Eight #1 pro Killian Carroll made the trip to Tucson from Boston to defend his 2017 Armed Forces Tribute singles and doubles titles. Carroll successfully defended his R48 Player’s Championship for the third consecutive year in early May to cap a sensational 2017/18 R48 season that saw “Flash” win a staggering six of seven R48 stops, making him the most prolific single-season R48 Men’s champion in the seven-year history of the tour. Joining R48 #1 Killian Carroll in the star-studded Armed Forces draw were top five R48 stars Sean Lenning (#2), Mando Ortiz (#3), and David Fink (#5), as well as local favorites and top 18 R48 pros Shorty Ruiz (#12) and Abraham Montijo(#18). Current USHA Collegiate Men’s Open singles champion and former R48 top 30 pro Leo Canales, Jr. rounded out the deep Armed Forces men’s pro singles draw. Carroll predictably advanced to his second consecutive Armed Forces final with three routine wins, allowing double digits in just one of his six games en route to the final. Carroll’s sternest test came in the semifinals against R48 #3 Mando Ortiz, as Carroll saw his 15-5 first game lead cut to 16-15 after a frenetic Ortiz run. Carroll scored 26 of the final 29 points of the match to advance. R48 #2 Sean Lenning’s road to the final was not nearly as smooth as Carroll’s, as he failed to close out the first game of his quarterfinal match after leading 19-14 against Leo Canales, Jr., needing a tiebreaker to advance to the semifinal. 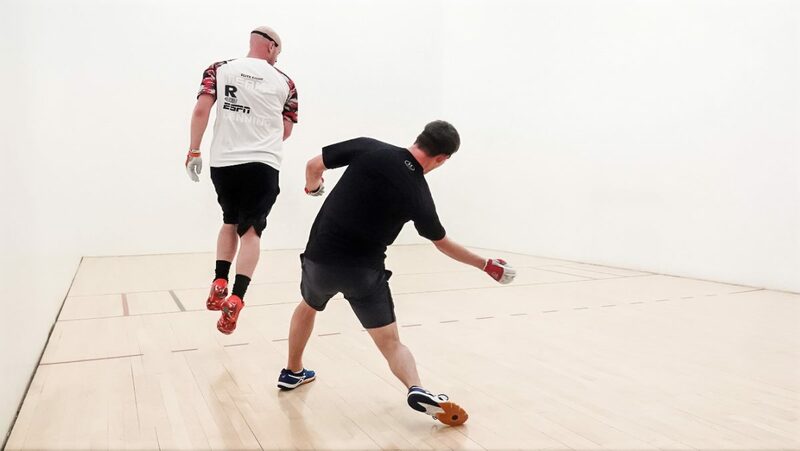 Lenning’s semifinal win against R48 #5 David Fink was more straightforward, as Lenning was in control for most of the way, needing only to survive a late second-game Fink rally to close out the match in two games. Carroll and Lenning met five times during the 2017/2018 R48 7 season, with Carroll winning four of the five encounters. Carroll and Lenning staged a Memorial Day Weekend Fireworks show in the sensational two-game final, with both superstars lighting up the highlight reel with incredible dives, kills, re kills, and outrageous shots. Carroll started quickly in the final, leading 4-0 before Lenning took a timeout to stretch his legs. Carroll stretched his lead to 7-0 when Lenning seized the momentum, scoring nine consecutive points in just four minutes. Lenning skipped a back wall setup by inches at 9-7, handing the serve and the momentum to Carroll. Carroll would take a 14-11 lead and eventually lead 17-14. “These games to 21 are completely different,” Carroll would later say. “We’re used to going to 15 on the tour and 15 feels like just halftime in these 21-point games.” Carroll and Lenning traded points and side outs and points until the end of game one, with Lenning appearing too fatigued to finish rallies. Carroll seized game one, breathing a sigh of relief after clinching the one-game lead. “We were both really tired in there,” stated Carroll. The five-minute break appeared to reenergize Lenning, and Lenning started quickly in game two, building a 4-0 lead. Carroll climbed back into the game, making incredible retrieves and shots to take control. With Carroll leading 17-16, the pair staged one of the most exciting rallies in recent memory, with both players diving three times and Carroll ultimately winning the rally on the 37th shot. 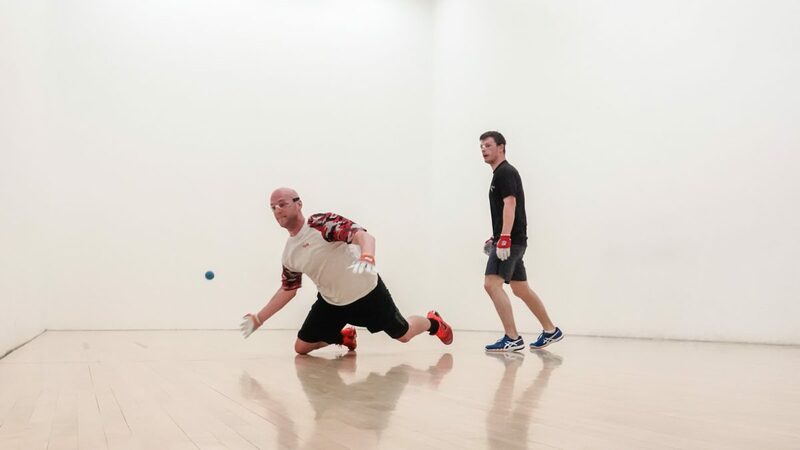 “I’ve been watching handball for 20 years and I’ve never seen anything like that rally,” stated Tucson handball fan Don Carroll. Carroll won the final four points of the match, clinching his second Armed Forces title. 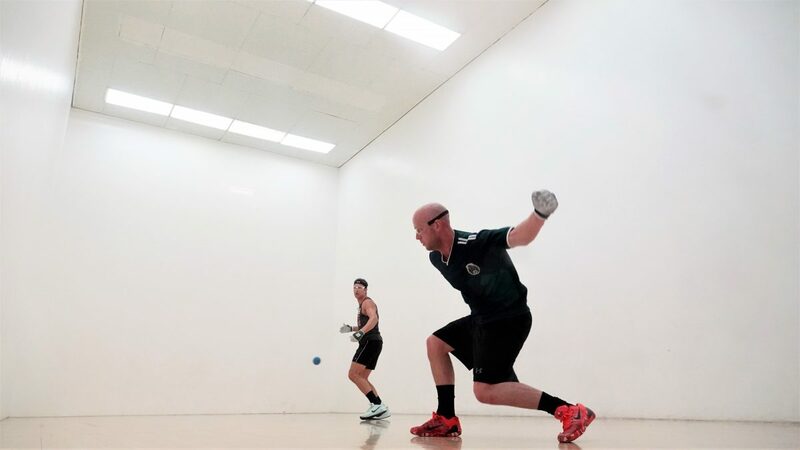 The ’18 Armed Forces Men’s Pro Doubles field featured seven of the game’s top men’s pro players. Team Carroll/Montijo entered the event as the defending champions, having never lost a match together as a team. Team Carroll/Montijo kept their undefeated streak intact, cruising to the final. 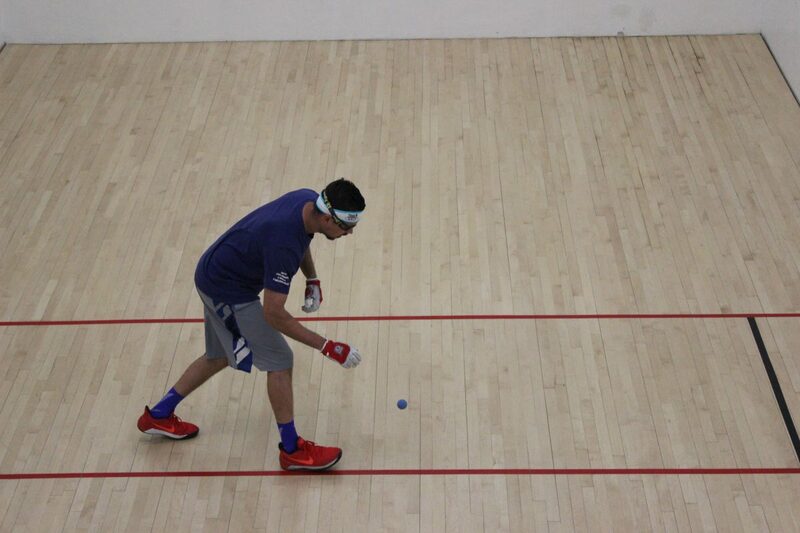 Team Ruiz/Ortiz have won numerous 3-Wall titles together as a team and maintained their team chemistry indoors, holding off Team Lenning/Fernandez in three games to advance to the final. Despite the noon wakeup call, Team Shuiz was not awake for game one of the final, dropping the game in just nine minutes. “A French fry?” questioned an exasperated tournament assistant referee Jesse Aranda in reference to the 21-1 score line. Team Shuiz came to life in game two, taking a 12-6 lead on the strength of a boisterous glass-banging crowd and emotionally-charged handball. Team Carroll/Montijo was unfazed, scoring nine consecutive points to take a 15-6 lead. “This is just fantastic handball,” stated Brad Marker, who made the trip from Idaho to watch the best players in the world. 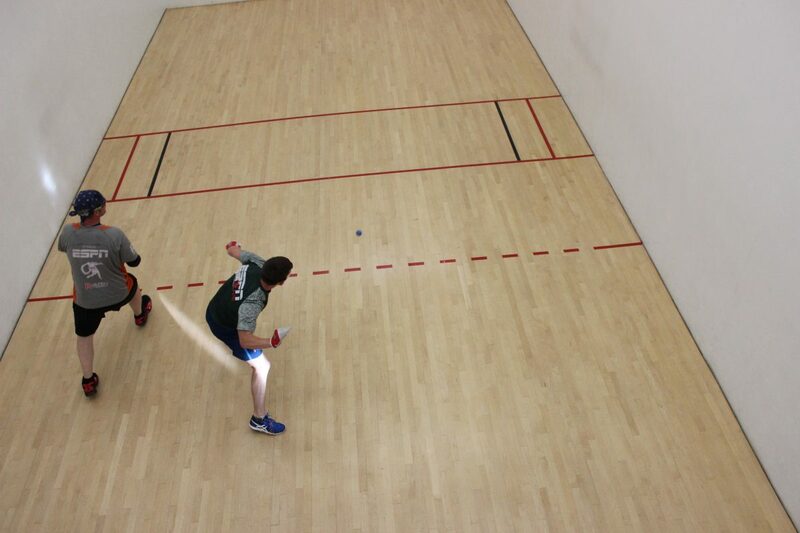 Team Carriljo would eventually lead 20-15, but four unsuccessful attempts to win the match led to a 20-20 tie. Team Shuiz was unable to capitalize on two attempts to force a tiebreaker, as Team Carrolijo clinched the Armed Forces for the second consecutive year to remain undefeated as a team. 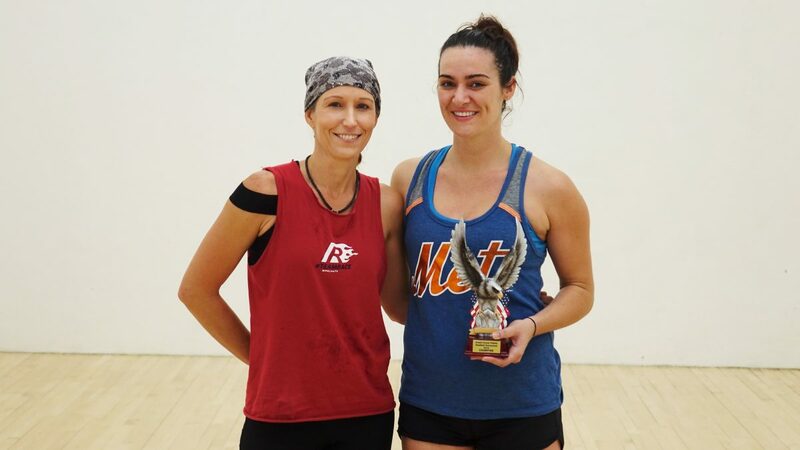 WR48 #6 Dr. Ashley Moler headlined a strong women’s pro singles field at the ’18 Armed Forces. Joining Dr. Moler in the Armed Forces women’s draw was 1990’s collegiate All-American Beth Blackstone and FLF juniors Belisa Camacho, Kena Byrd-Jackson, and Sophia Della Croce. Dr. Ash dropped just two points en route to the final, while Blackstone was pushed to the limit by teenage sensation Byrd-Jackson in the bottom bracket semifinals before advancing. 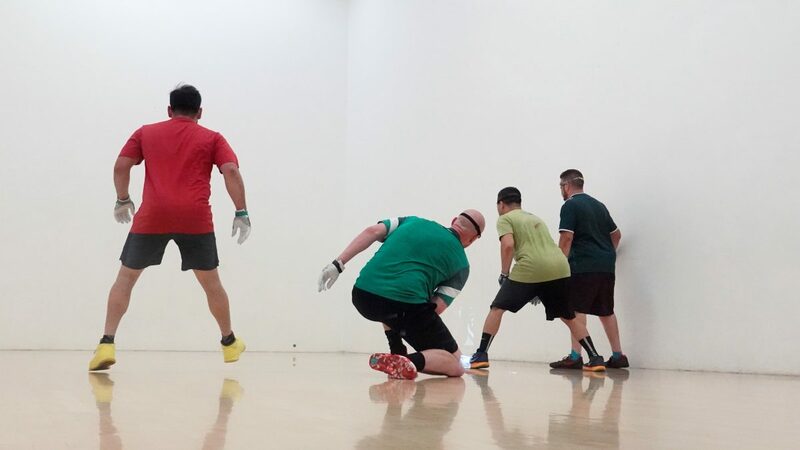 Thank you to tournament sponsor, the Fred Lewis Foundation, and tournament directors Fred Lewis, Abraham Montijo, Charlie Wicker, and Vince San Angelo for an outstanding weekend of handball. The Fred Lewis Foundation’s Salute to the Troops Handball Tournament (formerly, The Semper Fi, San Diego, CA), in Tucson, AZ, this memorial weekend, reached the business end of the tournament with Super Saturday, as players from three countries and twelve states all converged on the Tucson Racquet and Fitness Club to watch and play great handball (Brackets Posted Here). Current collegiate national champion Leo Canales, Jr. trailed R48 #2 Sean Lenning 14-19 in game one before reeling off seven straight points to take game one. “Leo made great shots to win that first game, finding the the right board with virtually every swing” stated ESPN/WPH play-by-play broadcaster Dave Vincent. Lenning rallied to win the match in an entertaining tiebreaker. 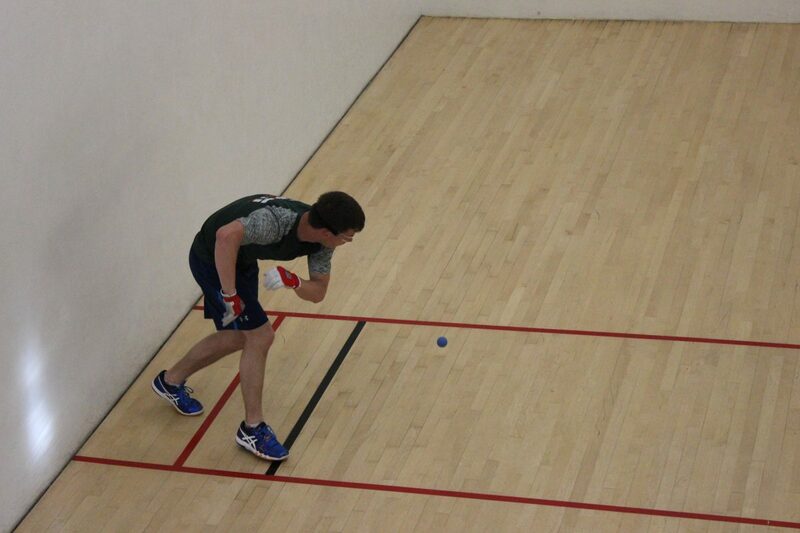 Killian Carroll continued to dominate in defense of his singles and doubles Armed Forces titles, dismantling Mando Ortiz in the singles semifinals and keeping his perfect record with partner Abraham Montijo intact in the doubles semis. The Fred Lewis Foundation’s Salute to the Troops Handball Tournament (formerly, The Semper Fi, San Diego, CA), in Tucson, AZ, this memorial weekend, is underway as players from three countries and twelve states all converged on the Tucson Racquet and Fitness Club for some competitive Handball (Brackets Posted Here). 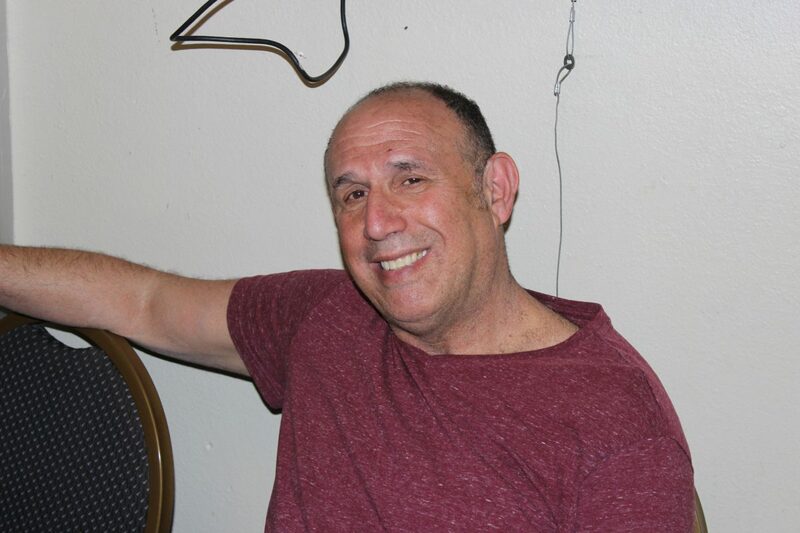 Tucson’s Vinnie Natale battled Juarez’s JR WPH Coach of the Year in a three-game thriller, with the 40-something Natale ousting the 20-something shotmaker in a dramatic tiebreaker. 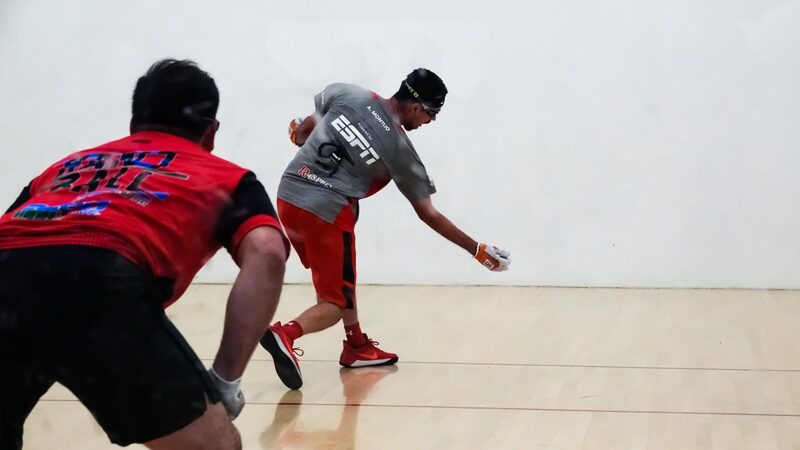 “Vinnie got hot to start the tiebreaker and held off Richie with clutch kills to advance,” stated tournament director and top pro Abraham Montijo. Can Killian Carroll continue his magical season? Can anyone stop the Carroll Express? Find out more by following the progress, HERE, or come back to this thread for updates.